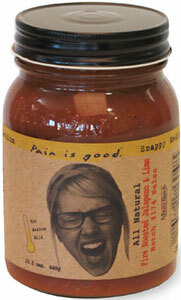 Pain Is Good Batch 174 Fire Roasted Jalapeno & Lime Salsa is smooth, sweet tomatoes that are combined with spicy, fire roasted green and red jalapenos, fresh cilantro, spices and a touch of lime. We think it is muy bueno and hope you will too! 15.5oz.